The Korean peninsula still dominates the global media in a one-sided look at the issue, the evil North Korea against the innocent US/South Korea. It’s almost as ridiculous as North Korea’s propaganda! In the latest developments North Korea has told the embassies in Pyongyang that, in the event of war, it cannot guarantee their safety and that they should strongly consider evacuating the country, it has asked to be notified whether they are staying or going by the 10th April. The US has moved missile defence systems to new locations including Guam and in a statement said that is is ready for any eventuality. 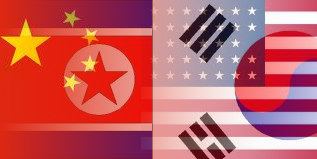 North Korea is guilty of lacking democracy, incompetent management, developing nuclear technology and a space program and as such pretty much just has China as a trading partner with sanctions coming from all corners of the globe. The US has a nuclear program, has used nuclear weapons against civilians and has a phoney two-party state ‘democracy’. If you box someone into a corner, the only rational response is to lash out, from a caged animal to a country. North Korea shouldn’t have nuclear weapons but should it be under such economic sanctions? Are North Koreans actions and words justified? Have you ever thought about understanding the situation from their perspective? No war, no nuclear weapons, it is the innocent, the working class who suffer. This entry was posted in Anti-War, Daily headlines, North Korea, USA and tagged China, Democratic Peoples Republic of Korea, DPRK, Guam, korea, korean peninsula, latest news, news, North Korea, nuclear weapons, politics, propaganda, Pyongyang, Republic of Korea, ROK, South Korea, update, US sanctions, war, 北朝鲜, 新闻, 中国 on 06/04/2013 by Leon J Williams.